Charlton Lido’s future is looking brighter after Greenwich Leisure Limited took on its lease in a deal which took effect on Wednesday evening. GLL, which runs Greenwich Council’s leisure facilities as well as scores of others around London, took on the lease from failed company Open Waters Investments, which had promised to turn the facility in Hornfair Park into a diving centre. The diving centre plans are now on the back burner, with the council now wanting to see a 50-metre heated pool at Charlton Lido open in time for summer 2012. Work would have to begin this summer, meaning swimmers will have to wait for an open-air dip – just as they did when negotiations with doomed Open Waters were taking place in the summer of 2009. The new lido scheme now depends on planning permission being granted by the council’s planning board in May, as well as raising funds from London mayor Boris Johnson’s community sports fund. Planning permission was renewed earlier this month for the diving centre scheme, which collapsed after Open Waters failed to secure funding for the project. The council is now concentrating on creating a heated pool at the site which would be open all year round. The entire scheme, including plans for a BMX track in Hornfair Park, is due to cost £2.8m. In response to a question from Conservative leader Spencer Drury, Culture and Olympics cabinet member John Fahy told Wednesday’s council meeting that the deal to transfer the lido to GLL – which had operated it before the doomed Open Waters deal – had only been signed at 5pm on Wednesday. 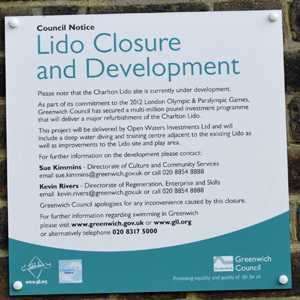 “With a fair wind, and subject to a funding opportunity from the mayor’s fund, and a contribution from Greenwich Leisure; we anticipate the lido will form a 50-metre heated pool, and we hope to have that up and running in advance of 2012,” Cllr Fahy said. This will be a fantastic facility for the area – I really hope that GLL can pull this off. They already run the London Fields Lido in Hackney another heated 50m pool which is a great place to swim in the winter. Much as I love the bike ride along the waterways to London Fields, it would be great to have a similar pool much closer. Just a point of clarification. The £2.8m mentioed is the total sum for Hornfair Park. This will include the Lido,Football,Cricket,and Rugby. In addition the BMX Track and other improvements will be a major boost to the area and a significant investment as part of the Council Olympic Strategy. Has anyone found out if there is progress with this project? Went passed the lido on the 12/1/2012 and there were skips outside and fencing up. Brilliant! Thanks for the updates.